News outlets over the last few months have been overflowing with reports on the impact of this year’s El Niño. The meteorological phenomenon, the strongest in 35 years, lasted 18 months and caused long droughts, unusually and unbearably high temperatures, along with water shortages and flooding around the world. In its wake, nearly 100 million people are enduring hunger and diseases, half of which are in Southern Africa. Now that El Niño is over —as sea surface temperatures have gone back to normal, with very little chance of rising again this year— the jury is out on whether the temperatures will stay neutral or continue to drop until the reverse effect —La Niña— is reached. Standing in El Niño’s aftermath, the answer to this question is a particularly relevant one for the global community. Although it cannot be answered without uncertainty, there is a high change that the world will see La Niña this fall. As described by the NOAA, “El Niño and La Niña are complex weather patterns resulting from variations in ocean temperatures in the Equatorial Pacific”. These meteorological events are opposite phases of the El Niño-Southern Oscillation (ENSO) cycle, which runs over the course of three to seven years. As mentioned above, during this cycle there are fluctuations in temperature between the ocean and atmosphere in the east-central Equatorial Pacific which can have significant, large-scale impacts on ocean processes and global weather and climate. Historically speaking, El Niño and La Niña typically last nine to twelve months, but as seen during the 2015-2016 El Niño, they can extend, spanning years. They usually develop during the April-June period and reach their maximum strength during December-February. 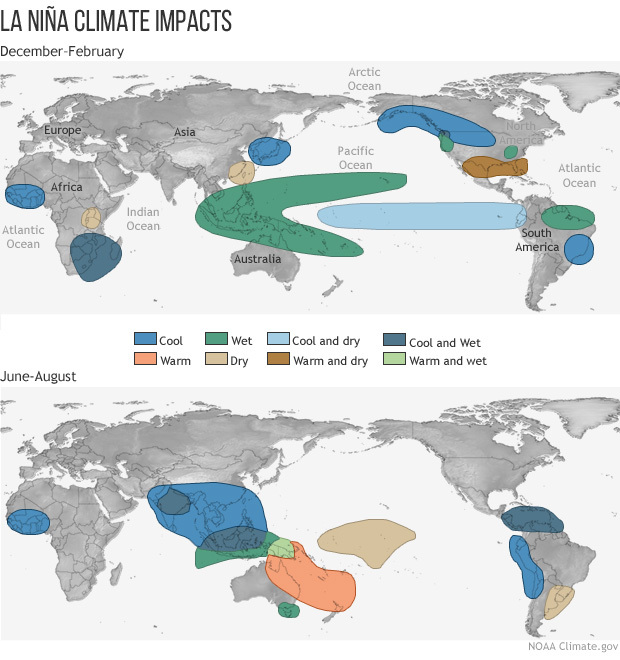 El Niño occurs more frequently than La Niña. Known as the warm phase of the ENSO cycle, El Niño means “The Little Boy” or “Christ Child” in Spanish. This phenomenon was originally identified in the XVII century by South American fishermen, who noticed the appearance of a warm southward-flowing ocean current every year around Christmas time, off the west coast of Peru and Ecuador. The time of the year when it happened gave El Niño its name. Later on, the term was restricted to unusually strong warming in the waters of the Pacific Ocean, which disrupted local fish and bird populations every few years. Currently, El Niño “refers to the large-scale ocean-atmosphere climate interaction linked to a periodic warming in sea surface temperatures across the central and east-central equatorial Pacific” (NOAA, W/D). Essentially, this patch of the ocean warms for an extended period of time, and then cools for reasons that are still not very well understood. El Niño effects include warmer and drier than average temperatures, such as those seen in India, the Philippines, Myanmar, Thailand, Laos, Cambodia and Indonesia. Countries such as Mongolia have experienced severe winters during this El Niño, with temperatures as low as -50°C (The Guardian, 2016). Other countries are at a higher risk of floods and landslides. This year’s El Niño caused flooding in Bolivia, Peru, the United Kingdom and Argentina, leaving thousands of people homeless (Reliefweb, 2015). Further effects of this meteorological event encompass changes weather patterns, ocean conditions, and marine fisheries around the globe, as well as an increase on the amount of hurricanes and cyclones. So what’s the explanation behind this? Well, the east-central Equatorial Pacific normally sees consistent winds, called trend winds, which blow from east to west. These winds push warm water near the surface in their direction of travel, so that warm water piles up on the western side of the Pacific Ocean, around Asia. On the other side of the ocean, around South and Central America, the warm water that’s pushed away by the trade winds is replaced by cold water, which comes from deeper down in the ocean (upwelling). This creates a temperature difference across the Equatorial Pacific, with warm water piling up in the west and cooler water in the east. The warm water that’s piled up transfers heat to the air, which in turn rises with more strength. The air creates an area of weather instability that generates more clouds and rainfall than normal. The rising air sets up atmospheric circulation in the ocean, with warm moisture rising up in the west and cooler, drier air descending in the east. The circulation gives strength to the easterly winds, a cycle that is broken with the start of El Niño. Under the right conditions, the weather systems on the Equatorial Pacific, or subtle changes in the ocean around this area unravel a series of events which can weaken or reverse the trade winds. With weaker trade winds, warm water does not get pushed to the western side of the Pacific, and cool water does not emerge from the depths of the ocean. This generates a warming on the usually colder parts of the Pacific, annulling the normal temperature difference in it. As warm water spreads out on the ocean, so does weather instability, which directly affects weather patterns over the Equatorial Pacific as well as large-scale wind patterns. This change in winds is what changes temperatures and rain patterns all over the world. La Niña, also known as the cold phase of the ENSO cycle, is the opposite of El Niño. During La Niña years, the east-central Equatorial Pacific sees below-average sea surface temperatures. This leads to winter temperatures that are warmer than normal in the Southeast and cooler than normal in the Northwest. La Niña strengthens trade winds, which moves warm water further towards the western side of the Equatorial Pacific, thus making the cooler water on the east spread out on the ocean surface. This causes temperatures on the east to drop below normal, as cooler water extends from the coast of South America to the central part of the ocean. Besides causing effects opposite to El Niño’s, La Niña also influences a surge of hurricanes in the Atlantic. DOES LA NIÑA ALWAYS FOLLOW AFTER EL NIÑO? Not necessarily, although there is a historical correlation between a strong El Niño and the occurrence of La Niña right after. El Niño generates Rossby waves at sea surface level. These waves travel in the opposite direction of El Niño, until they reach Indonesia, where they bounce off the landmass and go back. The Rossby waves generally reach the ocean six months after El Niño has reached its maximum strength and they cause cooling, thus sabotaging the El Niño effect. The stronger El Niño is, the stronger the Rossby waves are, so it is highly likely that a La Niña event will ensue in the months following to El Niño if this event has been particularly strong. As mentioned above, the 2015-2016 El Niño event has been the strongest in 35 years, and currently there is well over a 50% chance that a La Niña event will take place this year. Despite the high probability of La Niña happening, scientists are not yet convinced. Metrics on the correlation between La Niña and El Niño are limited. The average duration of El Niño has impacted the ability of scientists to take frequent data on the matter. Therefore, it is still too early to say whether La Niña will develop or not and how strong will it be.